“Defense wins championships,” or so you’ll hear if you listen to people who know a little about a sport talking about a championship run by a team with good defense. 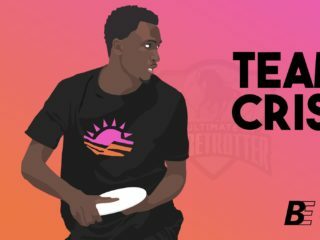 Well, I’m a person who knows a little about ultimate, and the Seattle Rainmakers defense just earned them a shot at a championship after upsetting the Portland Stags in a thrilling 16-15 MLU Western Conference championship game. Because so much of MLU action is shot from a midfield camera, even on replays it’s tricky to see exactly how defenses are operating. That said, both teams seemed to successfully take away their opponent’s strength. When the Rainmakers played for the deep shot, the Stags had two men in the area. And when the Stags tried to get things going with short passes, the Rainmakers swarmed to force errors. Late in the game the Stags were going for long hucks drive after drive and failing to connect. They hadn’t convinced with their short game, so the deep game hadn’t opened up. Stags cutter Cody Bjorklund was so strong all year, it’s a shame he won’t be in the finals. He’s a monster with long throws and in the air, and he had a pump fake in the third quarter that almost killed a Rainmakers defender. Aside from Timmy Perston, Bjorklund was Portland’s most notable player in the matches I watched. Because Seattle won, let’s give a bullet point to the Seattle Riot ladies playing for USA team who are running rampant over in the U23 world championship. Very cool. In the first half, Rainmakers cutter Isaac Entz had a diving catch on risky mid-length pass for a score that won the Grab of the Week. If I had known there was an award called Grab of the Week when I saw the catch I would have yelled, “that’s the Grab of the Week right there!” But I didn’t so instead I yelled, “there should be a Grab of the Week award so that grab can win something.” It was a really nice grab. The Rainmakers blitzkrieged down the field at the end of the third to get a point when the Stags should have been able to hold them; they then won the match by one point. 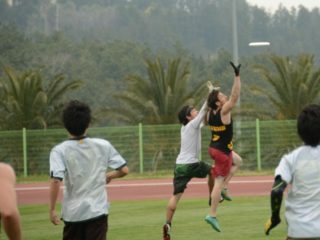 ULTIMATE IS A GAME OF INCHES (or in this case a lot of yards traversed quickly without running with the disc). Nerves were a factor. I saw a ton of mistakes in the red zone (is it called the red zone? I should know this by now). These were mistakes that these teams did not make in past meetings which is why the final score was so low. Some of this was about the increased defensive intensity. But some of those mistakes were the result of bad decision making under pressure. The equalizer that Portland got at 14-14 looked like the turning point. Seattle deflected the disc in the endzone, but the Stags still came down with the long huck, and tied a game they by all rights should have been trailing in. But then their ensuing pull went out of bounds and Seattle’s huck had the exact same result, getting deflected but landing in the hands of Gavin McKibbin who played out of his mind all game. 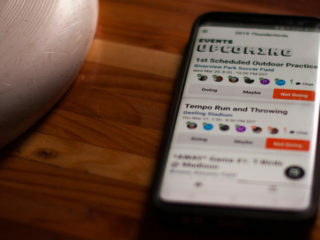 ULTIMATE IS A GAME OF INCHES (or in this case fingertips which can be measured in fractions of inches). Peter Woodside for Portland had a diving D at the end of the first quarter to keep the Stags within striking distance that will be lost to history. But it was a great play, followed by amongst the most genuine celebratory Hulk flexes I’ve seen in any sport, and it should not be forgotten. Playoffs are cruel. I guess that’s my real takeaway from this match: playoffs are cruel. Portland was excellent all year, and now they will not have the chance to compete for an MLU title because they made a few mistakes in one thrilling game. While I was rooting for Seattle (essentially because of where my parents decided to settle and raise me in the late 80’s) a part of me is sad that the best team in the west for the bulk of the year won’t get a shot at the title. Seattle has in the major sports historically been on the other end of this phenomenon (the 2001 Mariners, 2005 Seahawks and 1994 Sonics and 2014 Sounders all qualify), so my local biases also lead me to want some recognition for the team that played the best for the longest. I feel this way broadly about American professional sports. Club ultimate championships as I understand it are decided by massive tournaments; that’s a different beast. But so often in American sports great teams that lose in the playoffs are considered chokers, and fail to receive the recognition they deserve for having been excellent over a long swath of time. So let’s give that recognition now: the Stags were awesome this year, and while the Rainmakers closed the gap between the two teams every time the two met up, on aggregate it’s a little unfair that Seattle is headed to Philadelphia for the championship. But, also, hey! Life’s unfair. Pop the champagne Seattle ultimate fans, we’re heading to Philadelphia.